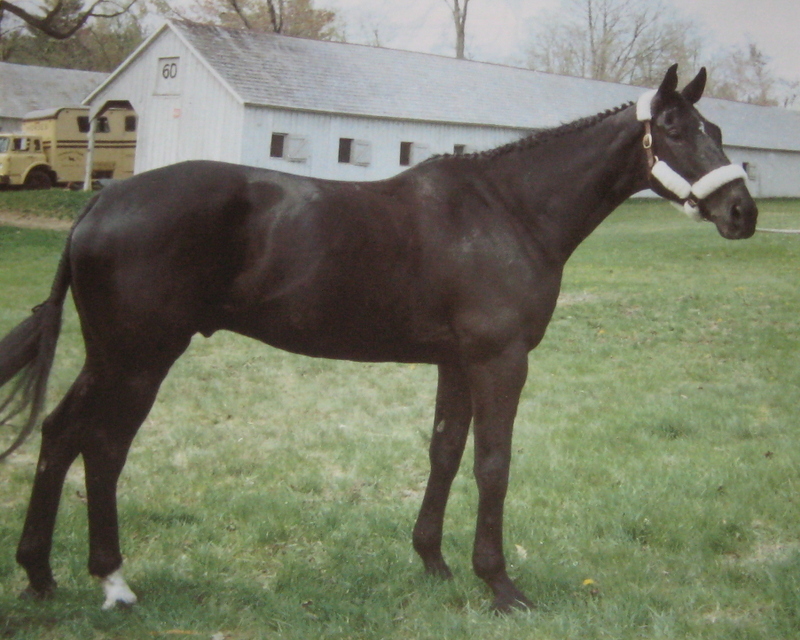 This is a photograph of my horse Renaissance in Saratoga, circa 1980. The St. Clement’s Saratoga Horse Show is the first big, outdoor, A-rated show on the Eastern Circuit each year. This year's show actually opens tomorrow with its 49th anniversary. My sister Michele, not seen in the photo, was holding onto the other end of Renaissance's lead. I can still picture the wind blowing her long brown hair across her face and the purple striped sweater she was wearing. She must have been 11 at the time; a skinny little girl leading that gigantic gentle giant like a puppy on his leash. At some point during that week long horse show Renaissance and I crashed through a large triple oxer in a junior hunter class, splitting heavy wooden poles as though they were tooth picks. It was one of the more dramatic crashes than are usually seen on a hunter course, and months later strangers would come up to me at other horse shows and tell they they had witnessed it. That was long before the mandatory safety helmets of today. I was wearing a black velvet hunting hat. I recently took a nostalgic look at it, and decided I might as well have been wearing a baseball cap. Of course the accident had been my fault because I had misjudged our distance from the jump. I remember my feelings of disgust over my poor performance. Looking back as an adult I see now that I could easily have been killed or paralyzed at 16. There was an interesting article in the Times last month that discussed the increased number of rider fatalities in the world of three day eventing. Mark Phillips, the first husband of Princess Anne, is now the Chef d'Equipe of the United States Eventing Team. He has gone under heavy fire lately for designing ridiculously dangerous cross country courses. Like many of the thoroughbred horses in the show world, Renaissance started his career on the race track. For every successful racehorses we see there are many many more who will never be fast enough to make any money, and that is what racing is all about. The luckiest of these slower steeds are retrained in dressage, show jumping and eventing. Others are sold at auction and end up pulling Amish carts or New York City carriages, and the most ill-fated are transfered to the slaughter houses in Mexico and Canada. If you think this is a rare occurrence read this article. The first barn I rode at was an enormous property in the rolling hills of Wilton, Connecticut. It was originally built by the Firestone family for their race horses. There were two barns that were so big we could ride our horses in them. There were an indoor arena and outdoor rings, paddocks and fields for riding and turnout. All of this was surrounded by miles of trails that twisted through the woods of Wilton and Westchester. But to me the piece de resistance was the race track. I do not remember how long the track was, but it was clearly regulation size and can still be seen on the Wilton Town Map, the only road in the shape of a perfect elongated oval. Years ago the track was paved over and luxury homes were built all around it, giving another example of old town charm lost. Like everything else, the track was surrounded by woods. Even the center was so thick with trees and brush one could not see across to the other side. I loved to ride out there all alone, just me and my horse, overcome with the quiet solitude of desolation. The thing about a horse who's been trained on the track is that they never forget how to race. It is one thing to canter out in an open field or even gallop after a polo ball, but neither comes close to the speed of a trained racehorse, even one who's not been on a track for years. When I gave him the signal Renaissance would break out from a walk to full speed in seconds. I would climb high out of the saddle, up over his neck, reaching my hands almost to the top of his head. A gallop is the only gait in which all four of the horse's hooves are off the ground at the same time. Unlike trotting, there is no up and down motion, so the rider's body remains very still. My adrenaline would soar to the thunderous rhythm of beating hooves and labored breath. And the whole time there was a subtle fear in my heart that with one false step it would be over for us both. We all had strict instructions not to race around the track. The uneven footing was far too dangerous for the horses. I stupidly ignored this rule. But even in my teenaged recklessness I knew not to gallop Renaissance the entire distance. We would run down one long stretch only, because even though he was a heavy boned thoroughbred I could sense from up in the saddle the stress being put on his legs each time they struck the turf. only to see that he had died so very young. your friendship with Kamil - i am so in shock that he is dead - thank you again. I can still picture that 'CRASH'... and remember the fear that enveloped me when it happened! The whole crowd said 'OHHHHHH' in unison and were almost as relieved as I when you and Renaissance got up and dusted yourselves off. Amazing that you ever had the courage to ride and JUMP after that..but you did. Can't keep a good man down. This was a beautifully written piece. Keep it up!!! I hope you check back for my reply. I am sorry you just found out about Kamil, but knowing that I shared my story with you makes me happy. Thank you for reading and writing. Where do I begin? So beautifully written and straight from your heart. I had no idea that you would take him out to the track, nor did I have any knowledge or recollection that Renaissance was a race horse. I do remember driving in the (shall remain nameless) and all of us discussing names. How we ever came up with Renaissance, I don't know, but it certainly did suit him. I was so young and I guess naive, because I had no idea the true talent, diligence or courage it took you to ride everyday. I don't remember that crash, and maybe it's better that I don't. Now that I am older and a lot less naive, I get quite nervous to watch you play polo. Although it is quite calming to be around the horses. They truly are gentle giants. All I know is I was quite happy to read that you called me skinny. I'm actually tearing up. Oh, that was a very sweet comment. But I cannot believe you don't remember the crash. There was even a picture of it I should try to find. It was taken just as we were coming down on the middle of the fence!